“Personal presence”can help you get a date, a mate, a job, or a sale. It can help you lead a meeting, a movement, an organization, or a nation. Presence is hard to define, but we know it when we see it. Someone walks into a room and people step aside. Heads turn. Conversation opens up to include them. They’re in charge—of themselves and any situation. Presence is not something you’re born with—anyone can learn these skills, habits, traits, and attributes. It’s not a question of status symbols or position. Personal presence involves genuine character and relationship know-how. It’s not who you are—it’s how you are, how you present yourself, how you act. Learn how you can master the communication skills and attitudes that will enable you to become a compelling leader and to communicate with credibility and power. Booher makes ‘presence’ actionable. This is my kind of book! I’m a big fan of Dianna Booher. 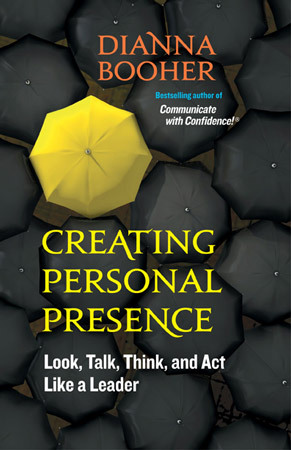 Her new book, Creating Personal Presence, will help you communicate the very best version of yourself as a leader. Read it! Co-author of The One Minute Manager® and Full Steam Ahead! This extraordinary book is full of invaluable ideas and insights that can help you to get paid more and promoted faster than you ever thought possible. Author of How the Best Leaders Lead, Goals! and Eat That Frog!